Garage Mats not only protect your garage floor, but will contain gallons and gallons of snow, water, mud, grit and grime that make a mess of your garage floor. If garage floor protection and containment are a priority to you, then our unique Garage Mat is the answer you have been looking for. The Park Smart® Clean Park® catches every drop of mud, slush and grime that falls off of your vehicle. Our Garage Mat keeps your garage floor clean eliminating the problem of tracking mud and grime into your home. The Clean Park® also keeps your garage and home safe by keeping all of your walk areas dry. The heavy-duty 20-mil vinyl, in conjunction with the raised plastic edges, holds gallons of liquid from spreading onto the garage floor. The specially engineered Snap-On edges are extremely durable, as well as fast and easy to install, without tools. All sizes of the Park Smart® Clean Park® come complete with 24" long Snap-On side pieces and 18" long Snap-On end pieces. 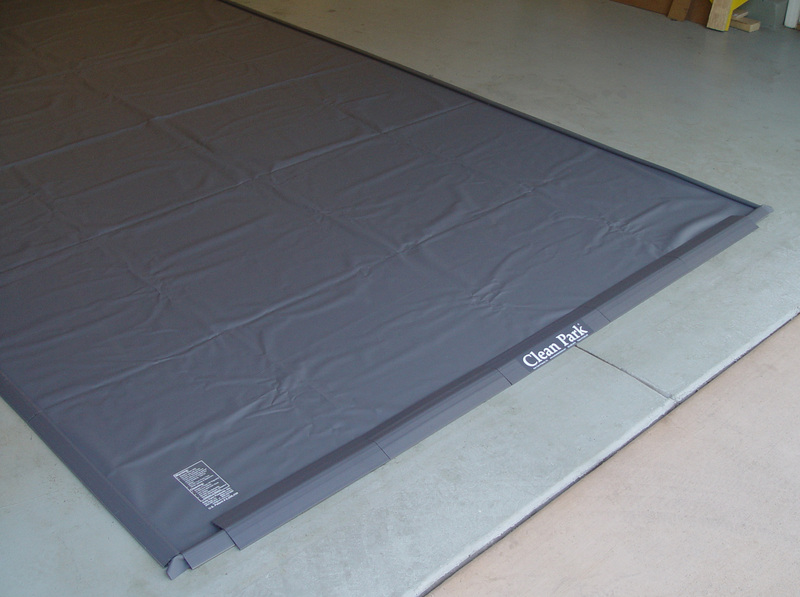 Our Garage Mat is so durable, that we offer a one year limited warranty. Q: Need new side edges for my garage mat can they be purchased without another mat? Q: These mats are fantastic. I have a 2-car garage but only one car. The snow thrower, etc. occupies one -half of garage, of course the car in other half. I have two 9x20, 20-mil mats and need to replace just one. Can I order just the mat? Assembly is required. The Clean Park® is folded up and shipped in a 24"x12"x10" box. Packaged in the box is the vinyl sheeting folded up along with a box containing the plastic side pieces. Approximate assembly time is 30 minutes. For Step-by-Step instructional Video, please click link below. Caution: The Clean Park® is Slippery when wet. It is recommended that you choose a size of garage mat that will enable you to easily park your entire vehicle on the mat while still allowing room for a walkway around your vehicle. Please Note: If your vehicle has studded snow tires or you use tire chains, your Clean Park® Garage mat will be damaged if precautions are not taken to protect the vinyl sheeting from the abrasive effects of studded snow tires or tire chains. We recommend using PROTECTOR STRIPS purchased from Auto Care Products or carpet runner protectors (without spikes), which can be purchased at your local hardware store.